If you like being warm during your rainy winter rides, and you have some dinero burning a hole in your pocket, you owe it to yourself to try a Rapha Classic Winter Jacket. Available in both men’s and women’s jackets, the warmth is unbelievable, while the reserved styling and cut are unparalleled. This rain jacket is so nice, you’ll want to wear it off the bike too. It’s not just the temperature control that nets the Classic Winter Jacket high marks. Every conceivable detail has been carefully designed for people who ride no matter the weather. The cut is just right to allow for a few cycling layers beneath it. The shoulders are cut to allow for reach and a full range of motion without pulling. A completely non-intrusive extended back provides rain protection over your bibs, yet somehow doesn’t feel long. Since winters offer limited daylight, Rapha built in reflective features at the shoulders, back of sleeves at the wrist, at the right and left rear pocket side seams, and in tiny dots at the bottom of the rear pockets. If you are riding at night, this is a jacket in which you will be seen. Rapha Men’s Classic Winter Jacket (images used by kind permission). The jacket’s reflective features are important if, like me, you like wearing all black, because it keeps the garment highly visible in spite of its dark color. If you like more colorful clothing, Rapha has you covered there as well, with new colors being introduced in different years. This year, in the men’s jacket, Rapha offers a chartreuse, dark orange, and dark grey, in addition to black. 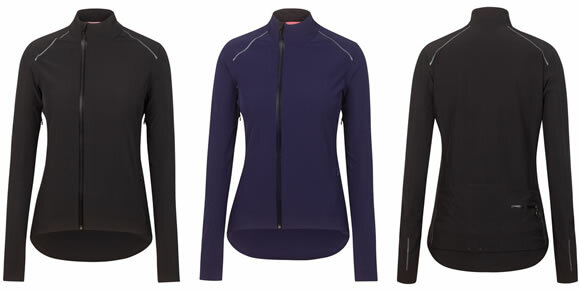 In the women’s jacket, Rapha offers navy blue and black. Rapha Women’s Classic Winter Jacket (images used by kind permission). An offset zipper makes it easier to unzip for ventilation and access, while not getting in your beard’s way. Speaking of zippers and ventilation, the jacket features underarm venting zips and a zippered key pocket. A double-access draw cord at the hem keeps the jacket sealed against cold winds. Winter cycling jackets often offer little pocket room, but Rapha’s Classic Winter Jacket features three roomy rear pockets that stay dry even when packed with your tools and favorite foodstuffs. The right pocket features a cable hole, which allows you to thread through to cable loops that run up the jacket’s side right to the collar. The warmth factor is really the star, providing a wide temperature range for usage in spring, fall, and winter alike. More than just a shell, Rapha utilized Polartec Power Shield Pro for warmth retention and breathability. This jacket is clearly designed for winter (hence the Classic Winter name), yet a wool baselayer and the jacket alone work well on crisp autumn mornings or drizzly spring days. In winter, you may not need a thermal jacket under this – it is that warm. Yet, if you find yourself riding in sub-freezing temperatures, a combination thermal layer and the Rapha Classic Winter Jacket can’t be beat. The women’s jacket features a hi-vis stowable drop tail. 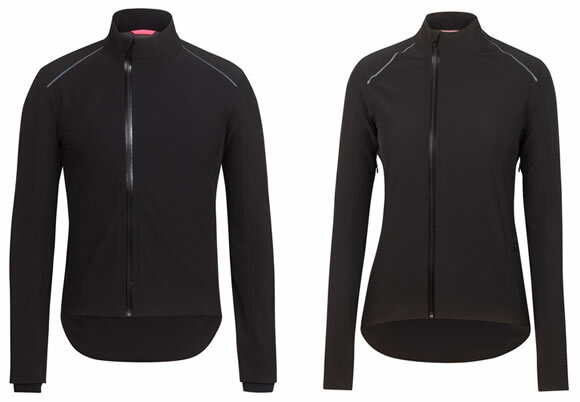 Rapha added an additional feature on the Women’s jacket: a stowable drop tail with a hi-vis reflective logo graphic. With so many features, you might wonder if the jacket is bulky, yet it’s not in the least. Instead, the jacket’s design is so finely tuned, you might forget you’re wearing it, except for the fact that it’s enabling you to ride comfortably in extreme weather. 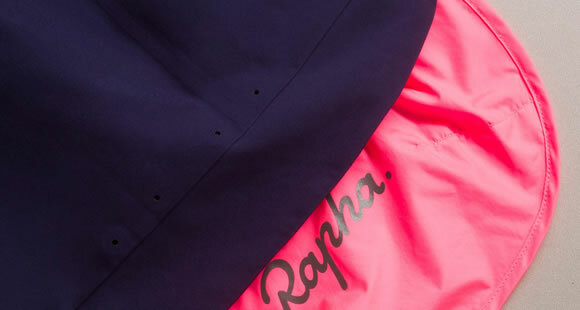 It’s such amazing attention to detail that has earned Rapha the right to claim cycling clothing’s throne. Like many Rapha garments, the Classic Winter Jacket takes an investment, but it is a worthy one. Few cycling garment purchases are so satisfying.